Nigeria is protesting about the detention of about 1,000 Nigerian women at airports in Saudi Arabia. 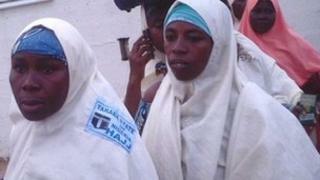 The women, some of whom have been held since Sunday, had been planning to make the Muslim Hajj pilgrimage to Mecca. Nigeria's ambassador to Saudi Arabia told the BBC the authorities were stopping women under the age of 35. Nigerian diplomats say the agreement between National Hajj Commission of Nigeria and the Saudi authorities allows visas to be issued for Nigerian women going to Mecca as long as they are accompanied by their local Hajj committee officials. Correspondents say many Nigerians have entered Saudi Arabia illegally to seek work. Since Sunday, hundreds of Nigerian women have been stopped at the airports in Jeddah and Medina. Nigeria's ambassador to Saudi Arabia, Abubakar Shehu Bunu, said he had made a formal protest to the foreign affairs office in the capital, Riyadh, on Wednesday. "They are stopping women particularly between the ages of 25 and 35 without a male relative. Those over 45 are not a concern to the Saudi authorities," he told the BBC's Hausa Service. One woman told the BBC her group were being held in Jeddah not because they were travelling without male relatives but because the surnames on their passports did not correspond with those of their husbands. "Our husbands' names are different from our surnames and they won't allow that," Bilkisu Nasidi, who travelled from the northern Nigerian city of Katsina, told the BBC's Focus on Africa programme. She said the hundreds of women were sleeping on the floor, did not have their belongings and were sharing four toilets at the King Abdulaziz International Airport in Jeddah.